500 gm. firm, chunky fish fillets, like cod or haddock or even cat fish. For a buffet, remove skin and cut into 2 inch pieces. Salt to taste. Rock salt is good. Add after tasting the marinade. Remember, chat masala also has salt. Wash and pat dry fish fillets with a kitchen towel. Cut into single portion size cubes. Size is your own preference. Leave them full, if they are small fillets. Prick fillets with a fork. This helps to absorb the marinade. Mix all ingredients for marinade in a bowl, add fish and gently turn over a few times to coat the fish well on all sides. Leave it in the fridge, in an airtight container, for a few hours or overnight. 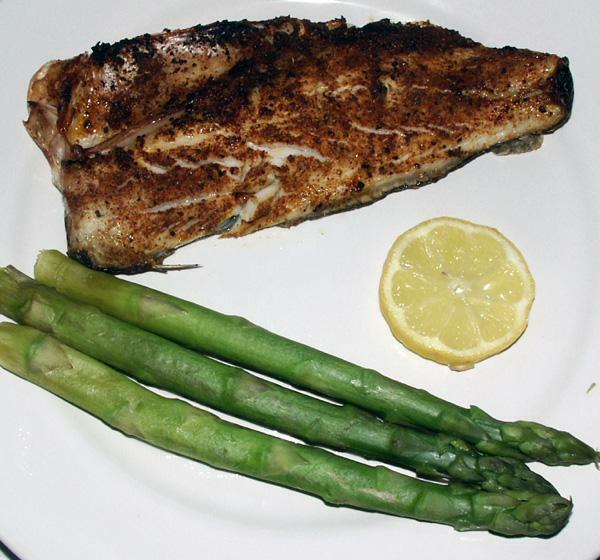 Place fish pieces on an oven-proof, well greased dish and bake uncovered in a hot oven at 200Âº C or 400Âº F, for 10-15 minutes. Fish should flake when touched gently with a knife. Make sure not to overcook it. Serve hot, garnished with sliced green chillies, a slice or wedge of lemon, red onion rings, and a sprig of dill (soa saag). You can serve it with any vegetables of choice or rice pilaf/pulao.